Choosing a new place to live is a truly daunting decision for most renters. With single bedrooms in occupied homes on one end of the spectrum, and lavish luxury apartments on the other, it’s important for renters to find a solution that provides the most value for their situation. One major factor for many people is amenities. Some apartments offer little to no amenities, while others come stacked with a swimming pool, gym, laundry machines, and virtual golf course. 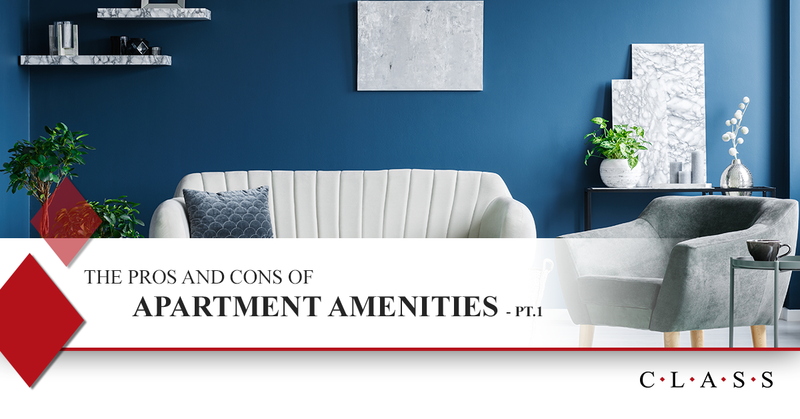 If you’re a property owner looking for apartment vacancy solutions, you might be considering the additions of amenities to your property. As professional leasing agents, we understand well the pros and cons of amenities, and we’re here to help you understand how amenities can help your property. In this two-part blog series, we’ll examine both the positives and negatives of amenities. This should be the most obvious benefit of amenities — the more cool stuff you provide for them, the more attractive your property becomes. Consider washers and dryers. Many renters calculate the cost of public coin-op laundry in the long-term and realize that it could add up to hundreds of dollars, paired with the inconvenience of being beholden to the schedule and availability of the machines. This type of renter is often very much willing to pay a higher cost of rent because their perceived value of free laundry overrides the negatives of more expensive rent. Amenities of all shapes and sizes are invaluable for incentivizing people to sign a lease, so use them to your advantage! Many property owners just have their eyes on the prize — more tenants. But they’re often so focused on gaining new tenants that they don’t pay attention to the ones that are slipping through the cracks every time a lease agreement ends. Having amenities not only helps to attract renters, it also helps to keep them. While your little workout area with free weights and treadmills might not stack up to Gold’s Gym, many tenants will find that having it in their backyard is a better alternative than having to drive to a local gym and pay its expensive membership fee. Many tenants that actually take advantage of amenities grow attached to them, making it a win-win for both you and them. As a property owner, you know the unfortunate truth that tenants vary in “quality” all across the board. You’ve got the hard-working, well-rounded individuals that are perfectly pleasant, who may live next door to the social recluse who never pays their rent on time and may or may not be doing hard drugs in their apartment every night. Fortunately, amenities have the potential to form a sense of community on your property. A pool area allows children and families to meet each other. A dog park allows dog owners to befriend fellow canine aficionados. A clubhouse allows for you to host events such as holiday parties where your tenants can mingle. The list goes on, but overall, amenities encourage tenants to be more social and friendly. As a general rule of thumb, this is beneficial for you. It leads to greater happiness among your tenants, and it attracts people who are interested in being productive and social, which often end up being more reliable renters. Amenities are a great way to improve the desirability of your property, but they’re certainly not the only factor. If you want to fill your apartment vacancies ASAP, contact Class Inc for quality leasing services that are tailor-made specifically for your needs. In the meantime, don’t forget to check out part two of this blog series for the downsides of amenities!